The Florence Duomo, officially known as the Cattedrale di Santa Maria del Fiore, is a symbolic and artistic landmark of the city. As one of the largest churches in the 15th century, the Duomo’s historic display of wealth and prominence overshadowed cathedrals in surrounding cities. However, the story of its construction exceeds the lifetime of its creators. 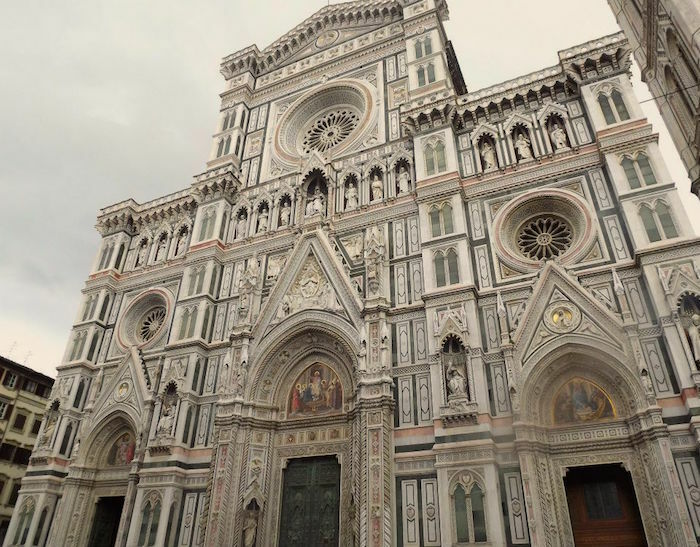 Today, the Florence Duomo is one of the most popular attractions in Florence. 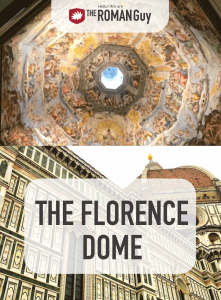 In this guide, you’ll learn the history behind Florence’s big red dome as well as how to see the Florence Duomo. You can see the Florence Duomo just about anywhere in the city. 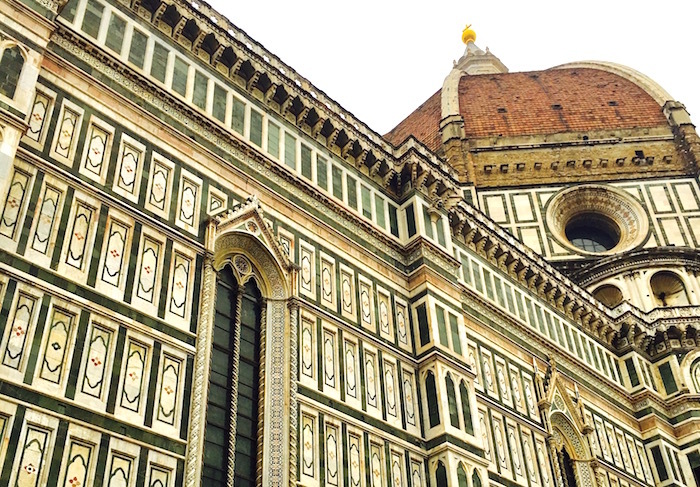 The church’s vast red dome has made the Duomo an iconic attraction in central Florence. 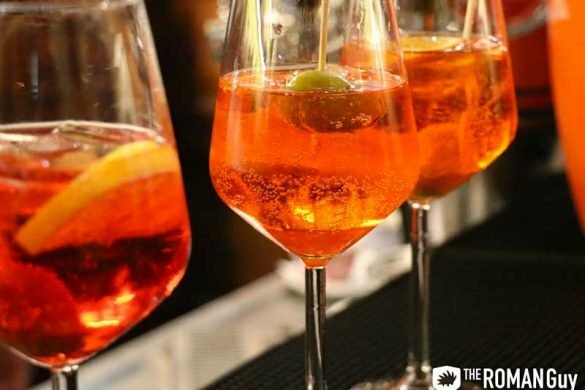 Luckily, we offer a variety of Florence tours that visit the Duomo. Our Rome to Florence Day Trip visits the Duomo’s exterior. For a more immersive Duomo experience, our Michelangelo’s David and Florence Duomo with Dome Climb gives you extensive history about the beautiful cathedral and even the opportunity to climb the dome of the Florence Duomo, if you’re up for the challenge. Until 1412, Florence’s main cathedral was the Santa Reparata. Although the building provided centuries of religious practices and historical support for the city, the replacement stipulated the expansion of Florence’s prominence throughout Italy. Arnolfo di Cambio, the Duomo’s designer, began construction on September 8, 1296, when he laid the first panel of white marble with accents of green and red. Remains from the Santa Reparata are visible in the crypt of the Duomo. At the time, Cambio was well-known in Siena for his contribution to the marble pulpit in their Cathedral. He trained with Nicola Pisano to master architectural techniques until he began his own work. Other famous landmarks of his include monuments in Rome, Perugia and, most importantly, Florence. Although Cambio began construction in 1296, the completion of the Duomo wouldn’t be seen for over 140 years. The concept of enclosing the rooftop of the Duomo was too advanced in the late 13th century because Florentines lacked the technology to construct a dome of that diameter. Despite this major flaw in Cambio’s design, the Duomo’s construction proceeded. Eighty years into building the Duomo, they still hadn’t uncovered the technology for the cupola. Therefore, the Opera di Santa Maria del Fiore ran a competition in Florence to welcome the designs of engineering and architectural geniuses. One architect, Filippo Brunelleschi, won the competition for his keen knowledge on physics, geometry and structural designs. He presented a plan that provided inner and outer shells with spaces in between to keep the space intact. Although this structural foundation is an indispensable facet of modern buildings, his unprecedented design was originally frowned upon by scholars and architects alike. It wasn’t until Brunelleschi presented an egg that the judges accepted his idea. Because his idea was new, he had no physical evidence to prove that the building would stand on its own, especially at such a massive size. Determined to prove himself and his work to the judges, he met with them and brought one tool: an egg. He made all the judges attempt to stand an egg upright on the table. If you think it’s impossible to do, you’d understand the frustration of the judges at the time. After all the judges tried, Brunelleschi grabbed the egg and smashed it on the table, which allowed it to stand perfectly upright. At first, the judges laughed and claimed they could’ve replicated his childish antics if they knew they were permitted to break the egg. However, Brunelleschi insisted that not one of them came up with the idea, and after this thought, the judges approved his designs. The Duomo’s ceiling conveys intricate detailing and years of artistry paralleled to that of the outside. 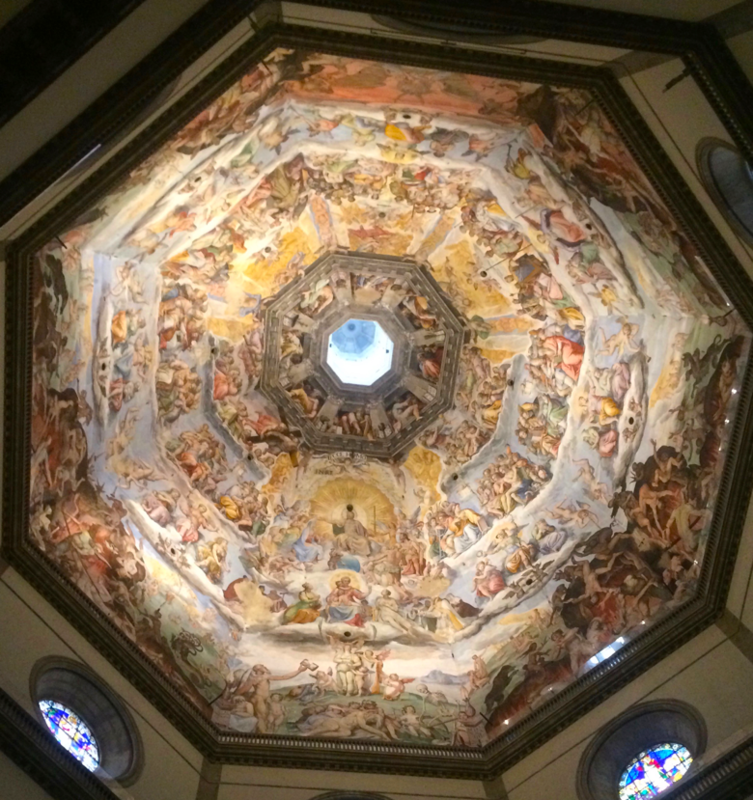 The Grand Duke Cosimo I de’ Medici commissioned two artists by the names of Giorgio Vasari and Federico Zuccari to paint the ceiling of the octagonal dome. Deriving inspiration from Dante’s Divine Comedy and mirroring the mosaics in Florence’s Baptistery, the artists portrayed the Last Judgment. Eight groups of figures depicted the scene within six circular rows of the dome to ensure that the cycle of religious events could be easily portrayed. These mosaics remain as one of the most prominent features of the Duomo itself, and many gather to learn the story themselves. 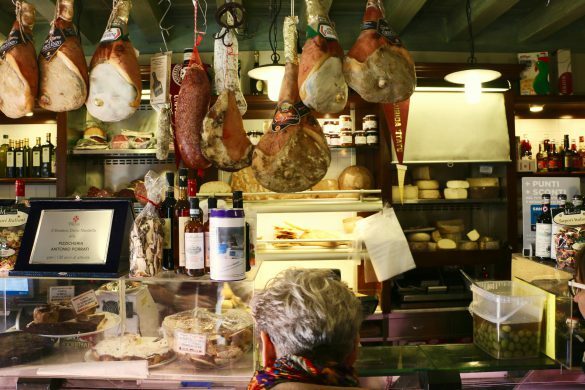 Looking to get a glimpse into Florence’s top attraction? As you enter the Duomo, you will immediately notice its gothic architecture. With its vertical emphasis and ribbed vault, the Duomo’s size will surely shock you. Want a closer look? 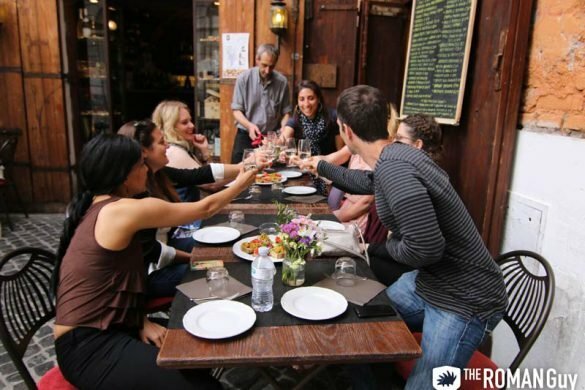 Join us on our Michelangelo’s David and Florence Duomo with Dome Climb to get the whole experience. 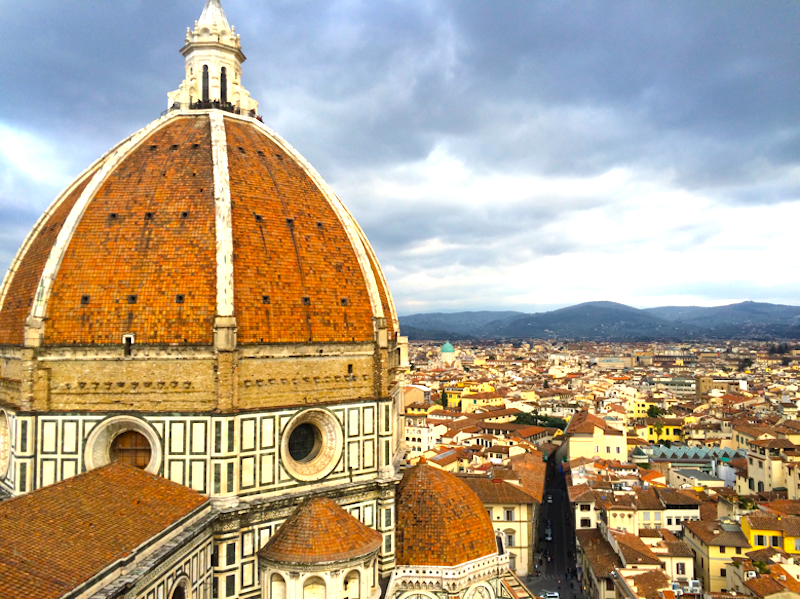 An experience of a lifetime is climbing 10 stories to the top of the Duomo. As one of the largest masonry cathedrals in Europe, the breathtaking view overlooks the entire city of Florence and beyond—a view unparalleled by any structure in the city. With no elevator, the 463-step climb gives an up-close observation of the ceiling in the Duomo and the surrounding marble, sandstone and brick. The trek is worth its weight in gold.